Located on the campus of Arizona State University, the Arizona Cardinals are the only NFL team that plays all its games at a collegiate stadium. In the mid 1950s Arizona State University decided to construct a stadium for its team, the Sun Devils. The stadium was constructed between two small mountains and was completed in time for the start of the 1958 season. The stadium was named after the team, Sun Devil Stadium, and had a capacity of 30,000. Since its opening in 1958, many additions have been completed at Sun Devil Stadium. Beginning in 1976, the capacity was increased to over 57,000. The following year the capacity was once again increased to over 70,000. Playing in St. Louis, the Cardinals began looking west for a place to move to in the 1980s. The team was tired of playing at Busch Stadium, also home of the St. Louis Cardinals (MLB) and was unable to get a football only stadium constructed. After the 1987 season the Cardinals moved to Arizona and Sun Devil Stadium. Prior to the team’s first season at Sun Devil Stadium, more expansions were completed at the stadium. Over 1,000 seats were added, along with an athletic complex on the south end of the stadium, a scoreboard, and four video boards. In 1989, a three-story, 60,000 square-foot building was constructed atop the upper deck on the west side, that contains two 30-suite levels, a modern press box and eight additional private suites. Today, Sun Devil Stadium has over 72,000 seats. The main grandstand is in the shape of a horseshoe. Additional seating is located in the south end zone. The video/scoreboards are located beyond the south endzone. 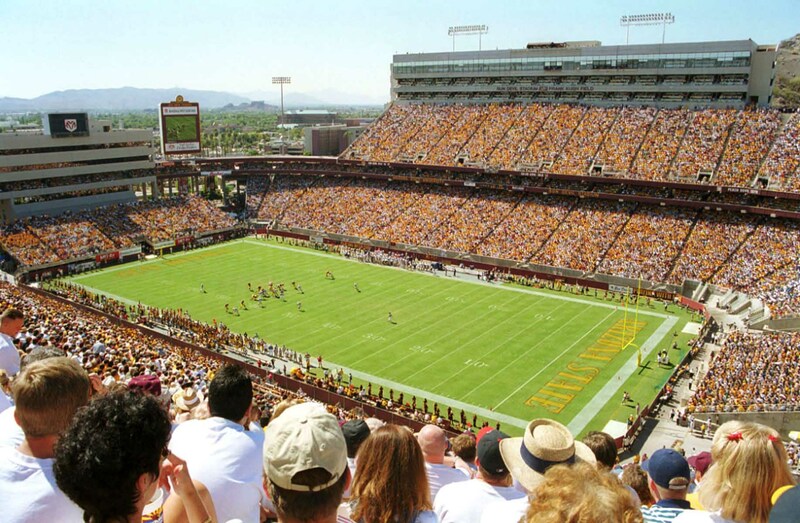 Fans who attend games at Sun Devil Stadium receive outstanding views of the surrounding area. The Cardinals played their last game at Sun Devil Stadium on December 24, 2005. In August 2006 the team moved into University of Phoenix Stadium in Glendale, AZ. Arizona State University continues to play at Sun Devil Stadium.